This private, luxury Rajasthan desert tour will introduce you to the best of the region’s desert landscapes, beginning in the ‘Blue City’ of Jodhpur. Nestled at the foot of the awesome Mehrangarh Fort, Raas is a stylish boutique hotel located in the heart of the old walled city, perfect for those who want to be in the heart of the action. Spend a morning exploring the fort with our experienced guide, before later heading out to the Bishnoi villages on a Jeep safari. From Jodhpur drive to the desert town of Jaisalmer for two nights at Killa Bhawan, a charming heritage property located within the fort itself. Highlights of this ancient and unusual city include impressive Jain temples, former palaces, and intricately carved havelis (mansions). You’ll then retire to Samsara – an idyllic desert oasis in the heart of the Thar – for a night amongst the dunes. On your first evening enjoy a camel ride and dinner around the open campfire. The following morning, take an exhilarating Jeep ride, through glorious dunes and remote desert settlements. Our Dreamy Deserts of Rajasthan Tour is designed to give you an idea of what’s possible and is simply a starting point when crafting your tailor-made tour of Rajasthan. It’s wonderful all on its own, or pairs perfectly as an add-on to our other suggested itineraries. Your luxury Rajasthan desert tour kicks off upon landing in Jodhpur, where you’ll be met by a member of our team at the airport. From here, you’ll be chauffeured to Raas and assisted with checking in for a two night stay. 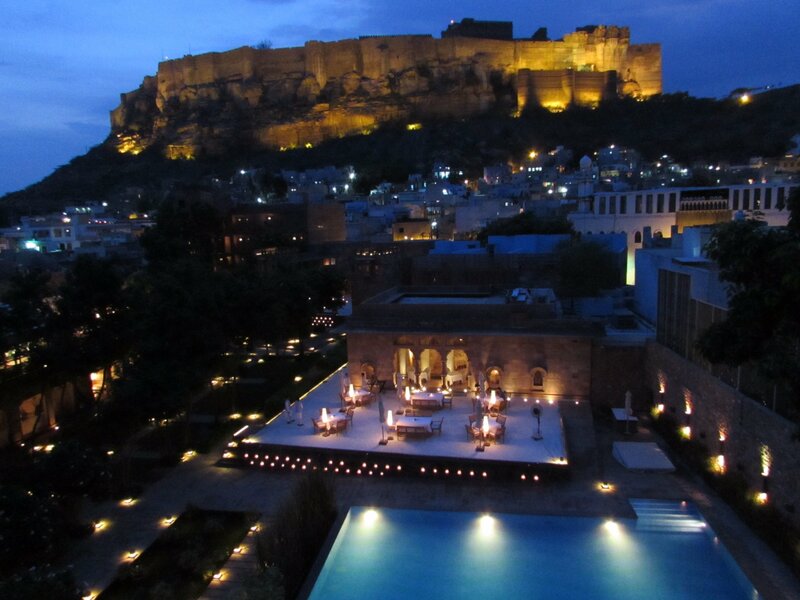 This glorious little hotel lies at the foot of the mighty Mehrangarh Fort, in the heart of Jodhpur’s Walled City. It is the only luxury hotel to be based in the old town and the views of the fort looming above are quite spectacular. Stepping away from the buzz of the old city and walking through Raas’ stunning gateway is like entering a peaceful oasis. The hotel is a beautiful contrast of old and new; slick décor and modern structures stand side by side with a restored, red sandstone haveli. This evening, soak up some of the culture with a private Bhopa performance – a rare Rajasthani art form which combines dancing, singing and painting. 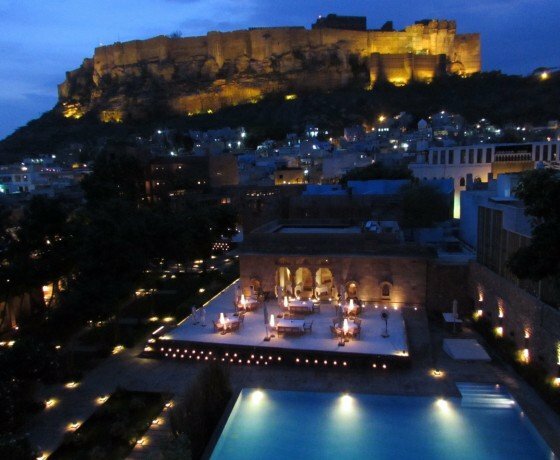 Afterwards, you’d move on to ‘Indique’ – a rooftop restaurant – for a traditional Rajasthani thali dinner with fabulous views of Mehrangarh Fort behind. The thali dinner is a lovely way to experience many different tastes of Rajasthan, as you’re presented with a small amount of several different authentic dishes. A guided tour of Jodhpur today takes in the majestic Mehrangarh Fort, Jaswant Thada, and a walk through the labyrinthine lanes of Jodhpur’s old city (if you’re feeling active, we also arrange this tour by bicycle, or those who’re not too firm on their feet may prefer a rickshaw – do let us know your preference; every detail will be designed around you). This afternoon, head out to the arid countryside on a Jeep safari. The scrubland south of Jodhpur is dotted with villages, their mud and thatch huts inhabited by the Bishnois and communities of potters and weavers. A tour of the area provides a memorable opportunity to observe the rhythm of daily life in these hamlets, experience the warm hospitality of the villagers, and see beautiful traditional crafts being practised. 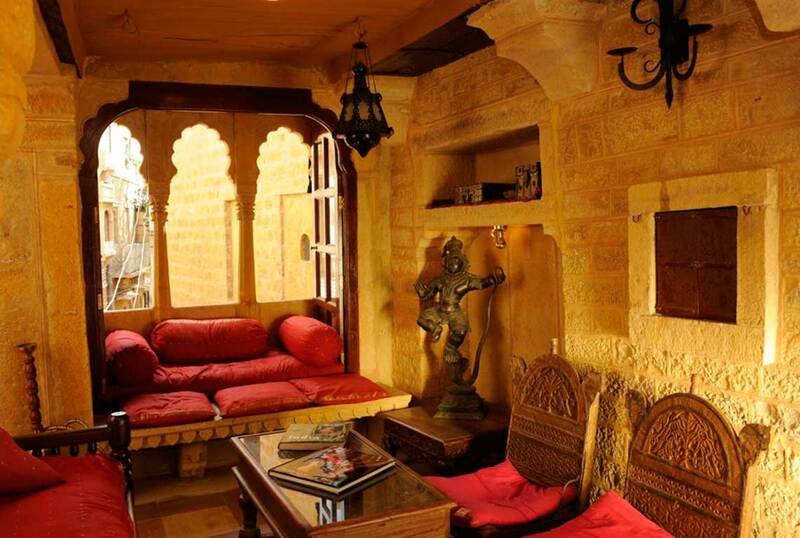 Head to the golden city of Jaisalmer for a two-night stay at Killa Bhawan. 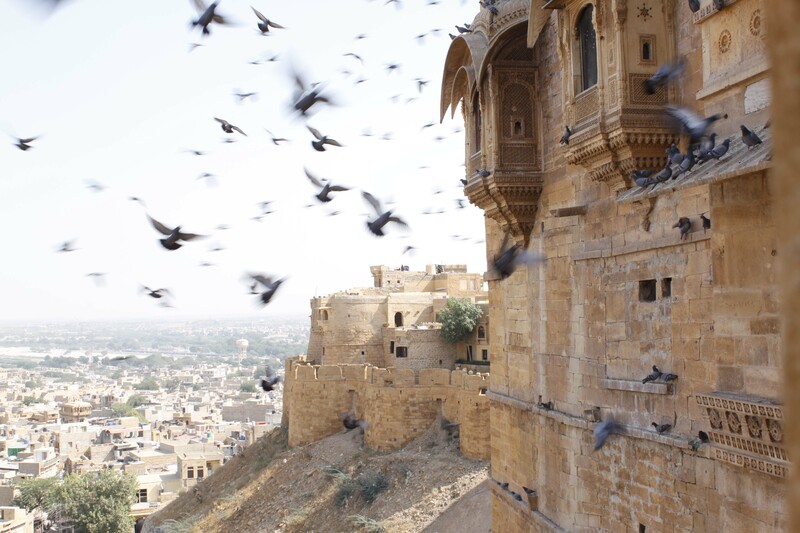 Set high within the watchtowers of Jaisalmer Fort, the charming Killa Bhawan offers beautiful views of the royal palace and town down below. Each of the five rooms is furnished in a traditional manner, with accents of bright colour, reflecting the local area perfectly. The delightful roof terrace is a highlight and offers sensational views. 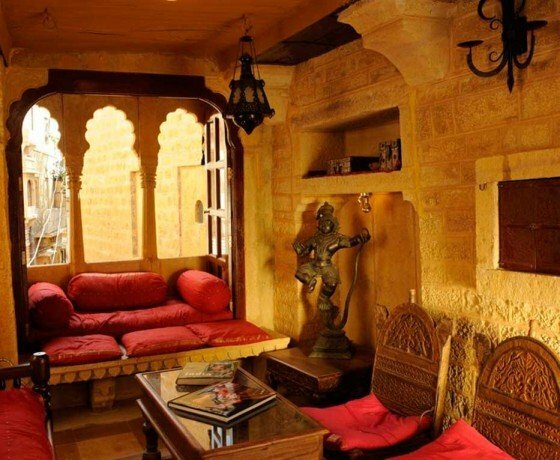 Being located within Jaisalmer Fort itself, Killa Bhawan is ideally located for those who’d like to embrace the rich culture of the city, people-watch and check out the local restaurants. For something with more facilities, Suryagarh is another favourite hotel of ours in Jaisalmer. Today you’ll explore the gargantuan Jaisalmer Fort and the beautiful temples and havelis (carved mansions) that lie within. End the day at Gadisagar Lake (once Jaisalmer’s only source of water). Your luxury Rajasthan desert tour climaxes today by heading in to the heart of the Thar Desert, for a night in a luxury tent on the golden dunes. At Samsara, evenings are a lively affair with colourful folk dance performances around a blazing bonfire. Rise early for a morning Jeep safari on the dunes, taking in stunning landscapes and remote desert settlements. After returning to Samsara for breakfast, you’ll then be chauffeured back to Jodhpur airport in time for your onward flight. Our journeys are inclusive of accommodation with breakfast, a private car with driver throughout, experienced guides, entrance tickets and excursions. In other words, we offer a seamless and hassle-free experience where the only thing you need to worry about is soaking up the sights and enjoying your fabulous hotels! This indicative cost is based on a couple travelling between October 2018 and March 2019, sharing a double or twin room. The cost may increase during the peak Christmas and New Year period. Samsara (the desert camp) is closed during the summer and monsoon months, from May through to September. This luxury Rajasthan desert tour is merely a starting point to share a flavour of the possibilities, and absolutely every aspect is flexible (from the hotels to the destinations to the length to the sightseeing). For example, you may like to explore Rajasthan further by including stops in Udaipur and/or Jaipur; or, take a Jeep safari in the jungle in Ranthambhore to spot wild Bengal tigers. Whilst we have suggested some of our favourite places to stay, this itinerary is 100% tailor-made, and a specialist can help you select hotel options best suited to your tastes and budget. Let us know what you’d like to create and we can make it happen!